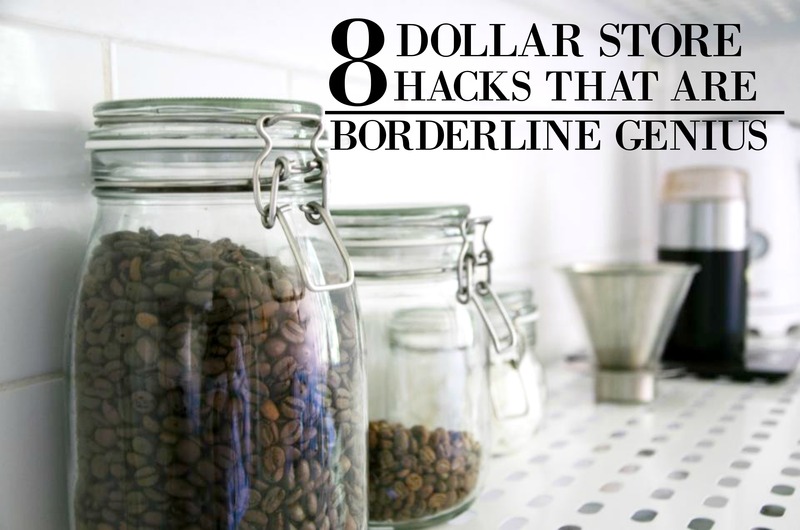 Share these dollar store hacks with a friend! When I was a kid, I had no interest in the dollar store. Why? Because my family never went. I had no idea that you could get the things you usually got at the regular store for so much cheaper. And I didn’t know until my early adult years that you could get so much awesome stuff for your home or for DIY projects from the dollar store. I mean there are so many good finds for such little money. And having some dollar store hacks up your sleeve only makes better! Whether you’re looking for some items for DIY, organization, or just to make your home a little more complete, you’ll probably find it at the dollar store. Now below are some great tips I found from different lists. I really appreciate the great content the lists have, so I thought I’d link to them and give credit to their awesome ideas. Each tip I pick from the lists are ones I personally feel are the best, but feel free to click through and find even more great ideas! Sticks guys! Sticks! Wooden sticks to create a pattern on your wall… I’m a creative person but I would never have thought of this. Now take in mind that you don’t have to do this all across your wall. You can do it on part of your room or on a shorter wall to add some nice accents to your room – You can find the tutorial here. Check out more DIY Ideas from Buzzfeed here! I don’t know about you, but wherever I’ve lived, I never felt like I had enough bathroom space. And that’s why this is one of my personal favorite dollar store hacks. My hair appliances take up way too much room so finding this tutorial helped me a lot. Take a look at the rest of Cute DIY Project’s ideas here! Now if you have young ones, you’ll appreciate this summer project. I’m pretty sure this super simple and cheap DIY project would have kept me busy for weeks on end – check out the tutorial here. See the rest of the dollar store kids projects here! I really like this one for the fact that I don’t like how mismatched my spices are. If there’s a deal on spices, I’m going to buy it. I’m not thinking of having a matching brand set of spices. So the fact that she found a great spice DIY project just from the dollar store gives me hope that my spice cupboard will be uniform someday too – check out the tutorial here. Check out more awesome finds here! I used to be a live in nanny (not for someone faint of heart), and I would get just a bit stressed out when the car became a wreck after feeding them. So knowing that many of you have kids (or are a nanny themselves), I thought you’d appreciate this one – find the tutorial here. Check out the rest of Buzzfeed’s dollar store hacks here! This one is great in that if you’re looking to do a more extensive DIY project, this tutorial has got you covered. Organizing your pantry might be overwhelming, but just remember that dollar store baskets are your friend. Now this might be useful even if you don’t have kids (keeps things that are usually upstairs from cluttering your downstairs). But if you do have kids, then some dollar store baskets are a great way to keep your house clutter free of their toys – check out the tutorial here. Find more awesome dollar store hacks here! Now I really like this one because this blogger goes through the store and shows you what you can get there and save money on. And to be honest, I get a lot of my kitchen supplies from the dollar store because it literally makes no difference. They look just as good as the more expensive brands (and no one’s gonna know unless they shop there too). Check out more on what you can save money on at the dollar store here! DIY projects are pretty fun, especially when they’re super simple and cost you hardly any money. And it’s also nice to know that you can get household items pretty cheap at the dollar store (no need to spend $10 on a potato peeler.. seriously, no need). Now if you have any awesome dollar store hacks, ideas and projects (or even tips on what to buy there to save money), let me know in the comments below! I’d love to hear them! I have one for all of you. I found watch batteries at the DOLLAR Tree. I also found invisible deodorant. The kind that doesn’t leave white marks underarm s on black marks. I also got antihistamines pills when I got stung by the bee’s. They’re cortisone cream and bandaid and triple antibiotics. They also have 5 X mirrors. And Great hair brushes. Thanks Linda, I didn’t know that they had 5 x mirrors, for that price I could have one for every room. I just love The Dollar Tree. I do a lot of journaling and get most everything I need there . I love their new organizers too not only functional but pretty too So much and more for just about anything you can think of! Nice share! We can find many great items on Dollar Stores. I often go there to buy the holiday cards, bathroom supply, and kids’ books, balloons. There are some items that I can’t believe I can get it for a dollar. This is a great roundup! I’ve been shopping at the Dollar Tree since I was a little kid. Some of my favorite items: organization supplies like stackable little baskets, cleaning supplies, kitchen items, notebooks and other school supplies, and snacks. I buy a lot of my Grocery items at Dollar tree.The same products at a much lower cost! I spent a total of 9 dollars on 8×10 mirrors they had to make a “wall of mirrors” well, a half wall, behind my coffee corner 🙂 I love it! Ask if they can special order a particular item in bulk…This helped me save a few hundred $$ for my wedding..I fell in love with some cute picture frames that I wanted to give to our guests that also paired with their table seating. I got about 400 frames for about $200. Bought a silver pen wrote our names and the date on the frame and printed out the guests name and table number and inserted it. AND I had plenty extra just in case I messed up. Dollar Tree items can be ordered online in bulk, and paid for and picked up in your local Dollar Tree. This way your supplies can be met while others who don’t need as much, still have some left in the store. I love shopping at the dollar store. There are so many things you can get creative with. Actually a couple of months ago, I was shopping at the dollar store and found Pepperidge Farm breads on the shelf. Turns out every Tuesday & Thursdays, they get a delivery from the company just like the grocery stores do, only smaller quantity. Loaves of bread that easily cost $3.99 each in any grocery store I can get for a dollar. Whoopie!!! I’ve bought lovely white dinner plates and matching bowls which are deep enough to for pasta and soup. I buy my aluminum cake tins, organizing items, covered shoe bins, white rain shampoo and conditioner, cards, etc etc. I even buy food. Love dollar tree for my craft projects also. Get cheap wire wisks. Fill them with seasonal candy. Tie a bow where the handle and wires meet. This makes inexpensive door prizes or small gifts (example, teacher gifts) , or shower/party favours. Hey Janice, I’m so sorry I got to your comment late! I’ve been so busy of late! I love DOLLAR TREE!! Ours is located right next to one of those big name “party” stores with all the decorations and plates, etc. BUT, why pay those prices when you can go right next door to the dollar store and get the EXACT same plates, same company and all, for a buck? AND, I make soap so, other than lye, I can get pretty much a whole batch of soap ingredients there for about 5 bucks!! I love the ideas! Thanks Silas and Grace! ? I get bread, tortillas, 18 count eggs, hair ties, zippy bags, school supplies, calendars, and snacks for the kids for school (cheese sticks, cereal bars, cheese crackers, etc). I love all their color, project books for children. Also school supplies and colorful pattern folders. Put them all together to make a Welcome package for any new children that come to our Kidz Club class at church! They children have a fun package to work on and remember our class! I am there all the time too. I have even blogged about it. I love the way you’ve pulled all of these together. Great job. I am going to have to venture out to Dollar Stores outside of my neighborhood because I know different buyers stock different items. Thanks for sharing. College kids need a little help, right? Every so often I pack my granddaughter a “goodie box” packed full of Dollar Tree items – office supplies such as pencils, tape, paper clips, pens, etc. ; laundry detergent & dryer sheets; kitchen supplies – aluminum foil sheets, aluminum pans, detergent, etc. ; she loves those Whales crackers and other snackies; toothpaste and a new tooth brush; batteries; candles, the list is endless. Needless to say, she is thrilled. They are going to “share” so why pay a lot more for the same quality you can get at dollar stores? DB, I love this! That is such an awesome and creative and helpful idea! It definitely sounds like something I’d like to do (or receive 😉 ). We travel to Azrizona in Feb and stay for a month. We rented a house that was totally furnished, then the house was sold. We found a condo to rent but no housewares and etc. I went to dollar store and challenged myself how inexpensive I could stock the condo. My husband was stunned by my thriftyness! I bought silverware, plates, glasses, etc. The bathroom was my best savings, for ten dollars, towels, washcloths, rug, stool cover, shower curtain shower liner and toothbrush holder. Plus when we departed for home items donated to help someone else! I like to buy nuts, dried fruits and seeds there and make trail mix for my family. So much cheaper than buying premade. Its the best place to buy items for missions too!! And for the preppers…cheapest place to pack your bug out bag!! I love being able to take my grandkids on an “adventure” outing and still be able to have $ for little treats that they picked out themselves. We all have a great time and they have learned to look all the aisles over before making their choices.